Our luxury escorted tours in Italy allows you to experience its stunning beauty, ancient ruins, amazing sculptures, exquisite art, tasty cuisine, fine wines, and so much more. Italy can satisfy even the most discerning travelers. Escorted tailor made group tours in Italy feature a professional tour manager to handle all of your needs and to ensure you get the most out of every location in Italy you visit on the tour. We have several amazing tours itinerary in Italy to choose from, or we can help you organize private customized tour in Italy for your group. You can have any trip tailor-made for your private travel in Italy. Your escorted tour in Italy can be as varied and endlessly fascinating as the country itself. Whether your passion is for art and history, architecture, natural scenery, classical music, wine and gastronomy your escorted tour of Italy will be truly memorable with us. Italy has been, since antiquity, the center of history, culture and art. Artistic wonders can be found everywhere, and every corner of the country holds countless and wonderful surprises. Italy offers a rich combination of masterpieces from different areas, blending landscape and culture, history and art, architecture and city planning – it offers an exciting journey through time, from the Ancient Greeks and Romans to the present day, which is also filled by a wealth of art and culture. ROME, FLORENCE, ASSISI, VENICE, SIENA, PISA, and NAPLES are Italian most renowned cities of art, but the whole country can boast towns of breathtaking beauty. Italy’s World Heritage Sites are well-known. The Dolomites; The City of Verona; Ferrara and the Po River Delta; the Historic Centers of San Gimignano, Florence and Rome; Hadrian’s Villa and the Villa D’Este at Tivoli; the archaeological area of Pompeii, Herculaneum and Torren Annunziata; the Sassi (rupestrian architecture and churches) of Matera; the Amalfi Coast are just some among many others. For music lovers, the festivals and operatic seasons offered by Milan’s La Scala and the Verona Arena are unique. Italian great lakes, Lakes Como, Lake Maggiore and Lake Garda, are the largest lakes in Italy, and have always been a major holiday destination. Their fame has never stopped growing. For art and history lovers, Lake Garda offers an attractive leap into the past: medieval villages clustered between walls and towers, and Veronese and Venetian castles recall memorable battles and great leaders. The elegant villas, favoured by royalty and the scene of important historic events, are evidence of wealth and power in times of peace. Visit famous destinations like Stresa, Ascona and Locarno and enjoy boat trip across Lake Maggiore to admire the Borromean islands, the castles of Cannero, the Brissago islands and fascinating shorelines dotted with picturesque towns and villages. Admire the beauty of Lake Como, its unspoilt landscapes, its banks filled with luxuriant vegetation, sumptuous villas and small villages of rare beauty. Escorted tour to unspoiled Italy – Puglia and Basilicata : discover breath-taking scenery, beautiful historic towns and villages, stunning coastline. Visit the famous Trulli and Sassi houses and enjoy lunch at a masseria. Visit picturesque coastal town of Trani and Castel del Monte- one of Italy’s finest castles, built by Emperor Frederick II. Visit Martina Franca, where Moorish influences have created a town of medieval palaces and churches and whose houses decorated with wrought-iron balconies could lead you to believe you are in Andalucia as you explore. You will experience the very best of this unspoiled region on our tailor made escorted tours Puglia and Basilicata . Visit Trento, known as the meeting place of the Ecumenical Council ; the city boasts a Lombard Romanesque cathedral and the Buonconsiglio Castle. Visit Bolzano, the “Gateway to the Dolomites” and symbol of the fusion of Latin and Germanic cultures, as can be seen in the Gothic cathedral. Visit Rovereto, with its museums, castles, the St. Colombiano Hermitage, Rosmini’s residence with a historical library, and the MART Museum. Discover the historical places and the memories of the First World War, like the Bell of the Peace. Enjoy your tour in Vallagarina: where nature, culture and taste meet together! Visit Riva del Garda, with the Pretorio Palace and its austere yet elegant 13th-Century fortress, the Rocca. Trentino Alto Adige is home to a wide array of events: from the traditional Christmas markets of Bolzano,Merano and Roverto to the festival of San Vigilio in Trento, as well as local festivals and countless fairs dedicated to wine, chestnuts, mushrooms and other excellent local products. Tour to Piedmont – Italy’s northwest region bordering with Switzerland and France, is unique experience. Enjoy visit to ancient villages and castles, the magnificent scenery of the Langhe, Roero and Monferrato, which has become a UNESCO World Heritage Site. These areas produce wines of international quality and excellence – such as Barolo, Barbaresco, Asti Spumante and Barbera d’Asti – rooted on the deep knowledge of the vines cultivated here for centuries like Nebbiolo, Moscato Bianco, Barbera. The charm of Umbria derives from its fusion of art, nature, peace and calm, the inspirations behind its various localities that comprise Renaissance masterpieces and small Medieval towns embedded in the hills. Umbria is perfect for those who love nature and want to discover its woods, castles and sanctuaries. Tour to Assisi, the birthplace of St Francis of Assisi, patron saint of Italy. Assisi is home of famous Basilica di San Francesco – one of the most important sites of Christian pilgrimage in Italy, and a UNESCO World Heritage. Pilgrims and visitors flock from around to world to view the tomb of St. Francis of Assisi and to admire the spectacular frescoes – most notably works by Giotto. Tour to Perugia,the art and cultural center of Umbria, world-famous for its chocolates . Enjoy guided tour of Perugia historic center and discover piazzas framed by fine mansions and a host of Etruscan and Roman monuments. Visit Perugina Chocolate Museum, located inside the factory that produces the famous chocolate and hazelnut Baci ‘kisses’. Tour to Orvieto – an ancient Umbrian town. Here you’ll find a stunning Gothic cathedral, an underground network of Etruscan caves and tunnels, and the famous white wine – Orvieto Classico. Enjoy tailor made tour to Italian coastline, from sparkling Sanremo to rocky Cinque Terre. You’ll explore the maritime history of Italy’s first port Genova, and stroll along the sandy beaches and shady promenades of Sanremo, famous for its flowers and sunshine. Visit Cinque Terre, these 5 fishermen villages, symbolize a group unique in the World for its beautiful landscape and the medieval style of their buildings. Admire Portofino and its colorful houses, pass through idyllic fishing villages, and watch the waves lap into charming ports. Other highlights of Liguria tour include the magnificent Riviera villages of Santa Margarita Ligure, Portovenere, Camogli , Sestri Levante and historic ports of La Spezia. Enjoy tailor made tour to Friuli-Venezia Giulia, a land rich in history, culture and beautiful landscape. stroll around the medieval town of Venzone and acient Cividale. visit Aquileia, the treasures of an ancient roman metropolis. Visit Grado, the Golden Island, joined to the mainland by a thin strip of land and embellished by a maze of island that form its evocative lagoon. Visit Gorizia, a border town with a Habsburg atmosphere, where you can breathe the history of the Great War and the Cold War. Visit Friuli-Venezia Giulia historical towns, enjoy delicious local cuisine, indulge in wine tasting and explore the beautiful nearby countries of Croatia, Slovenia and Austria. Your escorted tour in Italy can be as varied and endlessly fascinating as the country itself. From unspoilt Sicily in the south to the magnificent Lakes and Alps to the north, you’ll find yourself inspired at every turn by the charm and beauty of Italy. Tour in Venice is simply unique. Architectural treasures abound in St Mark’s Square, from the magnificent St Mark’s Basilica to the lavish Doge’s Palace, and the sight of the Rialto Bridge spanning the Grand Canal is unforgettable. Visit picturesque Murano island in the Venice lagoon – an island caught in time famous for its exquisite glassware. For art lovers, visit Accademia, with its world class masterpieces, or the Guggenheim for modern art. Embark on a romantic gondola ride through the charismatic canals of Venice while musicians serenade you with some of Italy’s best loved songs. Tour of Emilia Romagna: Bologna, Parma, Modena, Ravenna – Enjoy Sightseeing tour of historic Bologna, Italy’s gastronomic capital, seeing the stunning medieval centre and unique portico lined streets; See Ravenna’s unmissable 6th century mosaics, the world’s finest and a pinnacle of Byzantine art; visit the Ferrari Museum in Maranello, dedicated to the brand synonymous with luxury, glamour and speed. Visit Parma, a name synonymous the world over with wonderful Prosciutto and Parmigiano reggiano cheese; visit Modena and local producer of Balsamic Vinegar with tasting. Join us on tour around Rome‘s classical antiquities, medieval buildings, Renaissance palaces and intricate Baroque piazzas. 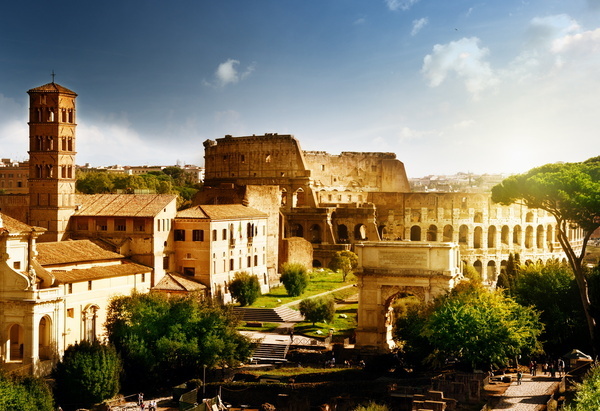 Enjoy guided tour of Ancient Rome – home to the Colosseum, the Forum, Pantheon and capital of the ancient world’s mightiest Empire. Visit to the Villa Borghese, housing some of the city’s finest museums. Explore the Vatican Museums and view the imposing St. Peter’s Basilica, the largest in the world. Visit Lucca, birthplace of the great composer Puccini, Pisa with its bizarre leaning tower and Siena famous for its cuisine, art, museums, and the Palio, a horse race held twice a year. Our tailor made tours in Italy cover every corner of the country, including major cities such as Rome, Florence, Venice, and Milan and small countryside locations like those found in Tuscany or Umbria. Luxury tours of Italy will take you to the magnificent Amalfi Coast, historic Pisa, scenic Lake Como, the Isle of Capri, mysterious Pompeii, the fascinating islands of Sicily, and all those other places you’ve dreamed of visiting on your tour of Italy.